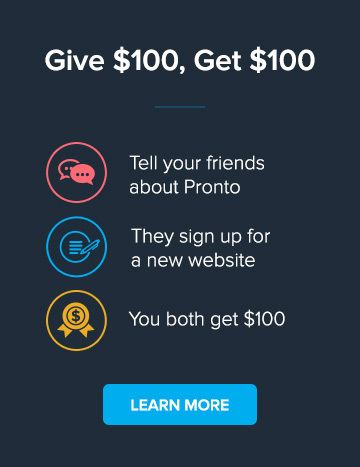 Pronto is using WordPress Multisite which is a set of features to allow hosting thousands of websites (or blogs in WordPress nomenclature) on a single WordPress instance. Allowing you to host your site outside of our servers would require us to give you access to our entire database along with data for all of the other sites we host. For security reasons, we can't allow this. Pronto has invested in significant development of tools and extensions to WordPress to enable us to provide high-quality websites that we can support and maintain for our clients. From a technical perspective many of these extensions, widgets and plug-ins aren't designed to be packaged for "take-away" into a different infrastructure, so many elements of a website would stop functioning or working correctly. In addition, from a business perspective we're don't do any custom development of websites, the investments and innovations Pronto has developed are valuable intellectual property of Pronto, developed for our use, not for license to others. "The server location is often physically near your users and can be a signal about your site’s intended audience. Some websites use distributed content delivery networks (CDNs) or are hosted in a country with better webserver infrastructure, so it is not a definitive signal." As a ranking factor, server location is basically non-existent. With the rise of CDNs (which Pronto uses), Google has learned that server location is no longer an authoritative signal for determining where your site is relevant. On top of that, neither of the two largest SEO studies mention it as a potential factor.